Let’s say you’re stuck in traffic at the intersection of Santa Monica and Westwood Blvds. with nothing to do but stare at one of three digital billboards broadcasting bright-colored ads at the captive audience in their cars. Would you believe that owning one of those billboards with a new ad blinking on every eight seconds could be a money-losing proposition? The Clear Channel digital billboard at that intersection may be a cash machine, but not all of the company’s estimated one million signs in more than 50 countries is doing so well, because the company reported a net loss of $76 million in 2010. That was a huge improvement, though, over 2009, when the Phoenix, Arizona, company reported a net loss of $873 million. 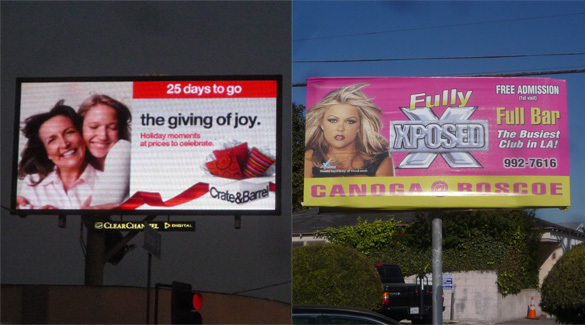 Lamar Advertising, headquartered in Baton Rouge, Louisiana, also lost money in 2010, despite having the distinction of owning the largest number of billboards both in L.A. and nationwide. The company reported a $40.1 million loss last year, a mild improvement from a $58 million loss in 2009. The city’s third major billboard company, CBS Outdoor, did much better, recording a 2010 profit of $288.6 million, up from $185.9 in 2009. The company is more diversified in L.A. than its two competitors, with a contract to provide transit advertising for the MTA and, and in a joint venture with JCDecaux, to install advertising-laden bus shelters and other items of street furniture for the city. The two other billboard companies with a significant number of signs in the city, Van Wagner Communications and Regency Outdoor, are privately-held companies and we have no way of knowing whether they turned tidy profits the last two years or posted ignominious losses.